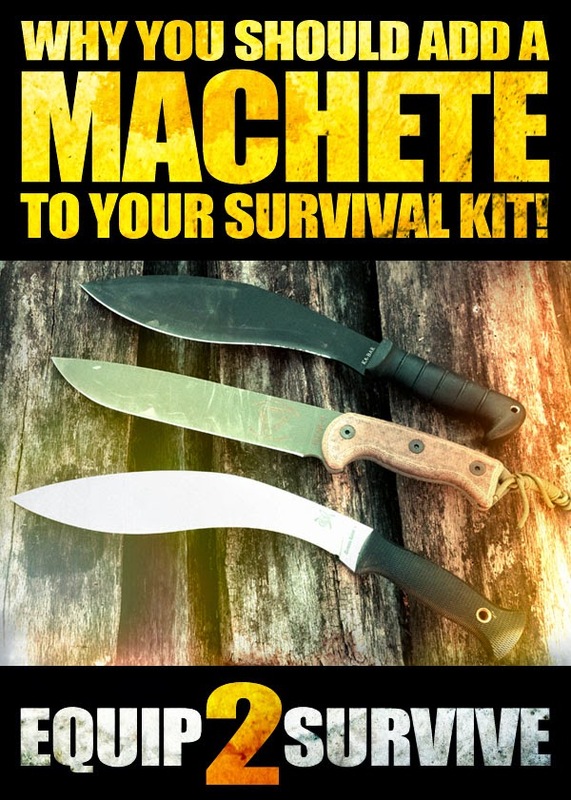 Survival and Preparedness from Equip2Survive.com: Why You Should Add A Machete To Your Survival Kit! 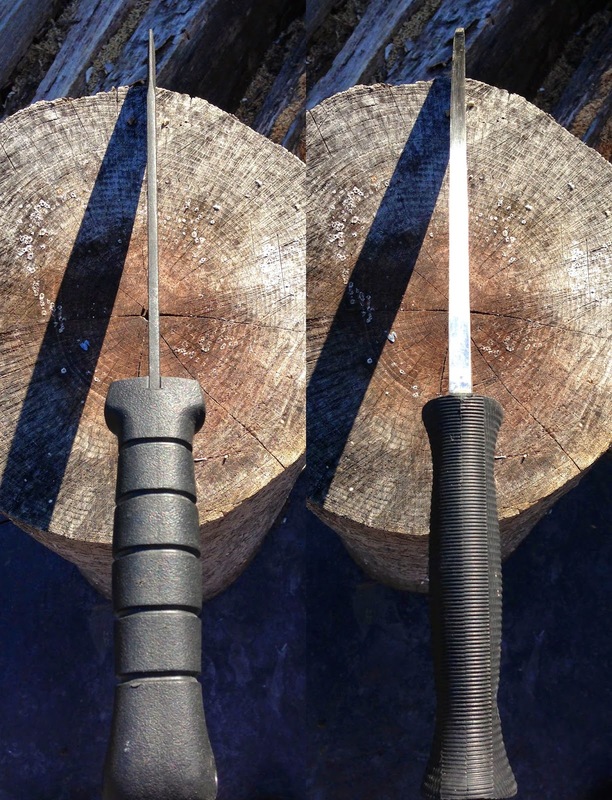 Why You Should Add A Machete To Your Survival Kit! situation, and not just for cleaving zombie heads! Machetes are far more useful tools for survival than many realize. When most bushcraft and survival enthusiasts think of standard core survival/bushcraft tools, we tend to immediately picture fixed blade survival knives, bushcraft saws and hatchets or axes (amongst others). While a machete isn't absolutely necessary, you might be surprised at how much a machete truly can add to your survival tool kit. Machetes are extremely versatile tools and can be considerable "game changers" in a survival situation. In skilled hands, a machete (depending on the design you ultimately choose) could arguably replace your knife and your hatchet! With the right machete you can chop wood, do fine carving, strike a ferro rod and many of the other tasks that you do with your knife, hatchet and axe! With a well chosen machete you can go from chopping directly to intricate carving without having to switch tools! This may not sound like a big deal, but when you need to construct a survival shelter with only a few hours of sunlight left, this can make a huge difference! large knife like a machete. 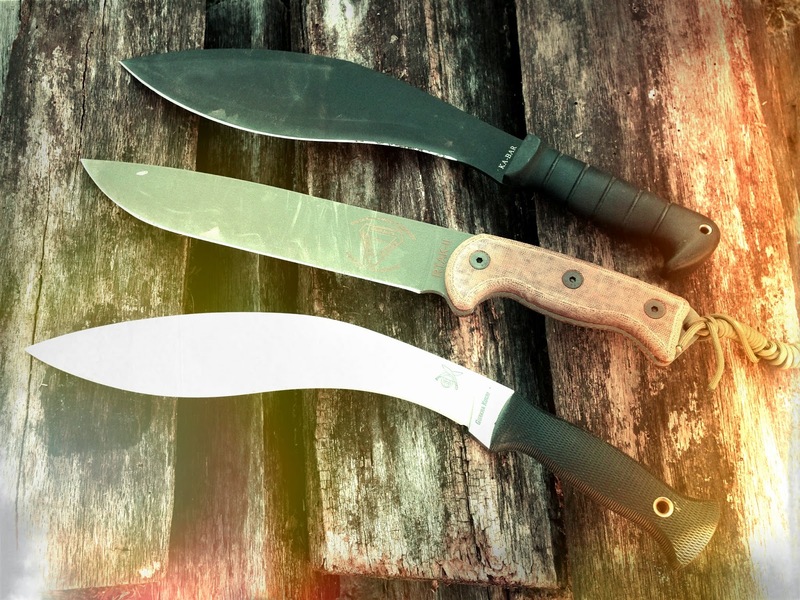 One challenge you will likely encounter immediately upon choosing to add a machete to your kit is determining... which machete is right for you? Just like with knives and axes, there are many types/styles of machetes, many brands and quite a range in terms of pricing. So which styles are best suited for your survival/bushcraft needs? What materials should your machete be made of? Which brand should you choose? And how much should you spend? Choosing the right machete is mostly determined by how you plan to use your machete and where. Do you plan on using it primarily in the jungle? In the woods? In an urban environment as a self-defense tool or weapon? As a zombie eliminator? Determining this will help you narrow down your options considerably for choosing a machete design/style that best suits your needs. The famous Latin style machete. The quintessential traditional machete (the style seen in movies and used in the jungle to clear paths of grasses, vines and vegetation) is known as the Latin Style Machete. It is a long and straight machete designed to effectively clear away brush, briars, vines, grasses and more. It is not a very effective wood chopper, but it excels at most other light and medium tasks. The Latin style machete is the machete traditionally used by the U.S. military. Latin style machetes are great tools, but they may not be the ideal choice for a survival machete. Fortunately we have other options available to us! The Asian Bolo Machete is similar to the Latin Style, but it has a notable performance upgrade. The Bolo Machete has added heft and weight toward the working end of the machete giving it much more of a punch for brute force chopping. The Bolo Machete, like it's Latin cousin, is a trailblazing machine with considerably more backbone. While the Bolo is a dependable chopping workhorse, it is not nearly as effective as other machete styles for more intricate tasks. This makes the Bolo a bit less versatile than other machete styles. The African Panga is very similar in nature to the Asian Bolo. The popular and versatile kukri. 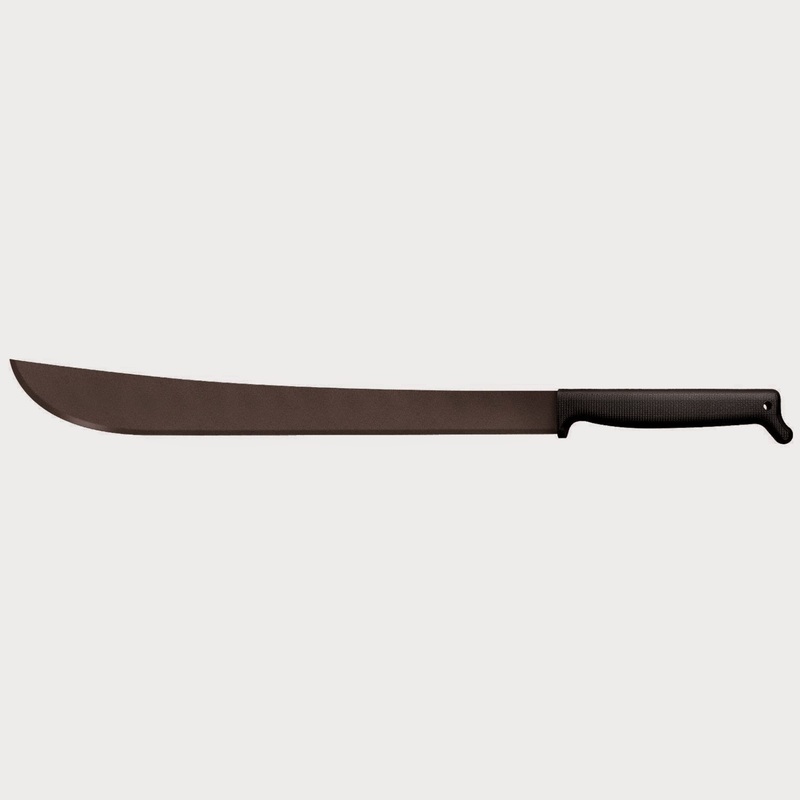 The Kukri Machete is a Nepalese design that has become extremely popular as of late. The kukri is actually considered an all purpose utility knife by the Nepalese people (much like the puukko is the everyday knife of Finland), but the larger versions of this knife are commonly sold around the world as machetes. The kukri has become extremely popular as a machete for good reason. It's inwardly curved edge, sharp point and innate balance due to it's shape and proportions make it a versatile tool, effective chopper, and a excellent weapon. The kukri in our view is easily the most versatile of all the machete styles as the outer edge of the blade is incredibly effective for chopping while the inner blade is outstanding for more intricate work and cuts. None of the other popular machete styles or designs touch the kukri in terms of versatility. There are a number of other machete styles that we could cover in detail, but the ones we have covered above are the most common and popular styles. One last "machete style" (in quotes because it is not technically a machete but is often used like a machete) worth mentioning is the American Bowie Knife. We include this famous American knife tradition on this machete page for several reasons. While the Bowie is a large knife as opposed to a machete, it has much in common with the popular kukri. The Bowie is a "king sized" multipurpose knife that has great chopping and slashing abilities, but the Bowie's design allows it to also be used for processing game and skinning! It is also a terrific weapon. We realize that we are taking some liberties by including the Bowie very loosely in the "machete" category, but the Bowie is arguably the closest thing to an American version of a machete. Just as the kukri is truly a utility knife yet loosely included in the machete category, the Bowie knife could easily be treated the same way. So how much should you spend on a machete? Machetes come in a range of prices starting at around $10 and climb up from there into hundreds of dollars and more. Part of determining what you should spend on a quality machete obviously depends on what you can afford. Most of the same rules that apply to knives in terms of price, quality, craftsmanship, construction, materials, etc. apply to machetes as well. $50 Ka-Bar Kukri and our $150 Cold Steel Gurkha Kukri. Remember the old adage "You get what you pay for". Some folks opt for the cheapest machetes and are perfectly happy with them. They don't see the point in spending more than $10 on a machete... until they actually have an opportunity to use a higher quality machete. Some of the cheaper machetes are basically sheet metal with an edge on them. Make sure you take a close look at the materials your machete is made of and its construction/design. A quality machete is going to be your friend for years to come. Fair quality machetes tend to cost around $25 to $50. I would recommend spending at least this much on your machete. If you are interested in a truly high quality machete made of quality materials and of a design that will excel in performance and last you for decades as a reliable tool, then spending $100 or more on a machete is far from out of the question and is something you should absolutely consider if you can afford it. $100 or more for a machete may sound expensive, but a $150 dollar machete can truly be a dream to use as opposed to a $50 machete. It really can make a difference. Machetes that are $200 or more tend to be more high-end collectors blades for special tactical purposes or with various handcrafted details that aren't necessary or even significantly helpful in the woods. Sure, we'd all love to have one, but these high end machetes are beyond what most of us truly need in terms of satisfying that "quality useful tool" void that most of us are aiming to fill by acquiring a machete. They are "drool factor" blades. That being said, if you can afford a really nice quality tactical or custom machete for your collection, then by all means go for it! Word of advice: Don't buy a machete just because it looks cool. Stay away from machetes with "Zombie" in their names. These are marketed to be novelty items as opposed to effective tools. Evaluate your prospective machete in terms of performance, quality in design and materials, comfort, balance and ease of use. You want a machete that is a pleasure to use and excels as a practical tool for the purposes you intend to use it for. Now that you understand the asset a machete can be in a survival situation, it's time to choose yours! Here are three that we have tested and recommend! The Ka-Bar Kukri is a great "entry level" quality machete at a reasonable price. While this machete may not have the balance, comfort and performance the next two do, it will get the job done. The RTAK-II, Micarta Handle, Plain, w/Sheath , while not truly a machete, is a terrific chopper that we love using as a machete. While not nearly as well balanced as the Cold Steel, this thing is a chopper. The Cold Steel Gurkha Kukri Kraton Handle is our absolute favorite machete by far. While more expensive than the other two models, this one is worth every penny in terms of comfort and performance! Want to see some more really killer machetes?? Yes, some of them are "drool factor" blades, but they are still fun to look at! Maybe some machete tutorials? Tips and tricks? Check out our Machete Pinterest board to see more machete amazingness! Follow EQUIP2SURVIVE's board Machete on Pinterest.